The Lake Superior ancient people's lost metallurgical technology used to manufacture copper tools and ornaments is being rediscovered one pounding at a time. The ancients left behind hints and traces of their industry and culture stretching back 6,800 years BP at South Fowl Lake, Minnesota (site 21CK1) in the form of copper and stone lithic artifacts and important worksite debitage. The French, British and Yankee mineral explorers from 1600 through the 1880s, including interested people today, have all marveled at how these tools could have been made using only fire and hammer. These important discoveries and others, plus his family legacy in blacksmithing dating back to his grandfather Julius's Prussian Army metal smithing, and Joe's personal experience of sixty five years as a metalsmith have led to a unique marriage with native copper crystals, float, half-breeds and arsenic copper (Mohawkite). In 1998 Joe was introduced to Ken Flood, Michigan Technological University geology graduate and owner of the Keweenaw Gem and Gift, Houghton, Michigan, who encouraged him to sort through thousands of float and mineralized carbonated specimens. 1. Select float specimens with a solid mass. This is very difficult to determine with green carbonate patina. Many apparently solid specimens are discarded after the first anneal when carbonation and/or oxidation is reduced by intense heat, allowing flaws and cracks to be observed. These flaws and cracks are mineralized elements (other than copper) or molecular minerals such as calcite. 2. Select floats of correct size. Cutting float to size by chiseling or hammering against a sharp gabro or basalt rock edge is a very difficult task. Copper is very malleable after annealing but remains very tough to chisel and cut. 3. Anneal the float to a red-hot glow on a white-oak ember bed. The length of time an ingot's red glow is maintained is not critical. 4. Cool the ingot by submersing in cold water or by merely pulling from the embers and allowing time to return to environmental temperature. The majority of this study was accomplished by cooling rapidly in cold water. 5. White-oak embers are hot enough to sweat or melt out silver in half-breed specimens, and the liquid silver atoms may form a sweat weld between copper ingots if lying in a contiguous state. Melt points are copper at 1981F and silver at 1761F (Kitco.Com). All annealing on embers occurred at approximately 950 feet above sea level at Joe's home near Pine City, Minnesota. 6. Arsenic nuggets (Cu3A5 or Cu6A5), commonly termed Mohawkite, are determined after the first or second anneal cycle by either a goldish or pinkish color and are discarded from further manufacture. These arsenic alloys are too brittle to shape by annealing and pounding. The specimens break up into smaller factions without the ability to flow and shape the ingot. Mohawkite was fortunately rarely encountered; however, it is disguised by green carbonate patina when found in float state. 7. Pound annealed "cold" float and resulting ingot into itself to form an approximately rectangular cube shape or a trapezoidal wedge cube shape. This stage may require numerous anneal-pound cycles depending upon the original float shape. A rectangle flat sheet ingot is required for rings and beads. A square cross-section ingot is required for awls, long fishhooks and pikes. 8. Ingots pounded in the cold state exhibit the same malleability as those pounded while in the red glow state and are much easier to handle when cooled in cold water. Hot ingot pounding reduces the number of anneal-pound cycles required to reach the final tool form. Hot ingots seem to retain malleability and can sustain more impacts than cold ingots, suggesting that hot ingots continue to realign molecular structure, allowing for "soft" malleability even when being pounded. 9. Pound annealed "cold" float or ingot until a ringing sound is produced or when the copper stops flowing with each impact. If pounding is continued when brittle, molecular cracks will develop which render the ingot useless for further forming of the intended final tool form. Throughout the entire anneal-pound cycles, a fine ruby red unknown dust is produced. This dust may be cuprite Cu2O, formed from the copper by the intense annealing heat combined with atmospheric oxygen. 10. Once an ingot's cubic shape is obtained, then further anneal-pound cycles will "flow" (push) the copper mass into the shape required for the intended tool. A rectangular cubic cross-sectioned ingot is substantially reduced in diameter, with the original length/width being pushed or made to flow from three to ten times the original length. The size and minerals or elements of the original ingot will determine the type and size of the final tool form. 11. The flow of copper by pounding is comparable to practicing with a rectangular cube of clay and pounding it with a small hammer. Clay, of course, does not become brittle and does not need the annealing step. The hammer impacts when correctly placed on the clay cube move (flow) the semi-fluid clay (similar to annealed malleable copper) into the new manufactured form (observation by Peterson). 12. Ingots are worked into form primarily through the anneal-pound cycle with the surface form often made by swedging the ingot upon an anvil of ungulate foreleg bone, antler base, hardened copper mandrel, convex or concave surfaced hard rock or specially formed hardened copper forms. 13. Bending through application of force on a lengthened portion with the opposite side of the ingot held in an anvil rock crack is utilized for some ancient tool forms, e.g., twisted-ulu-handle stems, This is an example of one possible method. 14. In all experimentation, grinding for the final form, if necessary, has been applied with Jacobsvlle sandstone from the Keweenaw Peninsula. Hard sharp edges for knives are produced with a final pounding followed with minor touch up grinding. Other abrasive sandstones may be used effectively. 15. Ingots may fail with fatal cracks developing due to impure (minerals other than copper or silver) sedimentation anytime between the first and last anneal. Microscopic layers of calcite, epidote, peridotite, feldspars and arsenic may be the suspected impurities that produce this fatal flaw condition. 16. 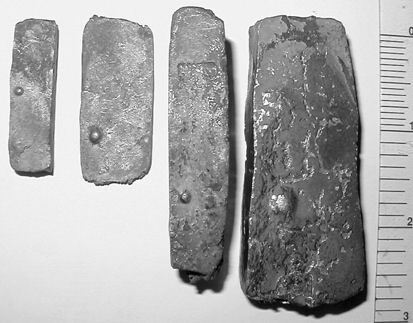 Portions of failed ingots may be salvaged into simple tools such as awls, fishhooks, staples, rivets and thumb scrapers. Many ingots demonstrate numerous scales or minor projections that need to be chiseled, pried off or ground off and discarded. The experimentation has produced hundreds of debitage that mirror ancient copper worksite in situ debitage discovered at the Robert-Debra Neubauer Site (21PN86). 17. The anneal-pound cycle may be repeated up to thirty times to achieve the tool's final form. The diamond cross-section knife or spear-blade design is one of the most difficult forms to achieve; however, several have been manufactured after very, very careful hammering. 18. Complex tools such as twisted-handle-stem ulu knives and deep socketed or shouldered knives have been pounded from half-breed (copper-silver) nuggets that maintain in final tool form the silver inclusion of the original nugget. This is accomplished by carefully controlling the white-oak-ember bed heat; e.g. not allowing the silver to melt out of the original copper mass. Maintaining a system to control the airflow over the ember bed is critical. Several half-breed specimens have had the silver inclusion completely melted out when close attention was not provided to control the embers' intensity (natural air flow). 19. Gas bubbles on the surface of several pounded and annealed ingots and also on completed tool forms are documented with silver inclusions remaining intact throughout the main body of the ingot or final tool form. This demonstrates that copper smelting is not required to produce the gas bubble trait. 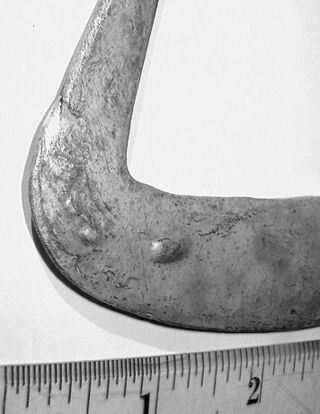 If the tool had been smelted, this distinct silver inclusion could not exist in the final ingot or tool form. 20. Several completed tool reproductions exhibit the raised copper bubble formed from gas expanding and attempting to be released from within the red hot copper mass. These bubbles are observed at any cycle and have often been observed near or at the last anneal-pound cycle. In an ulu's case, this represents thirty cycles before a gas bubble may develop on the tool's surface. Great care was taken by the experimenter not to pound these bubbles back into the forms mass; however, the ancients usually, probably without any hesitation, pushed the copper bubble back into the tool's form for strength and aesthetic styling of the tool being manufactured. 21. With skillful application of the "Neubauer Process," ancient tool forms can be annealed and pounded. Smelting has not been necessary to create complex tool and ornament forms with the intriguing gas bubble phenomenon. Silver melted in high temperatures can sweat weld copper ingots lying contiguous on the ember bed. This characteristic has also been demonstrated while using an iron tube container, for convenience, in which the ingot is annealed. There has been much supposition concerning how native copper Old Copper Culture artifacts and later copper artifacts were manufactured. Few individuals have systematically studied and experimented with copper tool production using native copper and wood fire. The following articles written by David H. Peterson appeared in the Journal of the Central States Archeological Society. No known kilns or crucibles capable of melting or smelting native copper have been found in the Lake Superior Basin, yet tens of thousands of artifact copper tools, ornaments, worked debitage and rock hammers have been found, provenienced and historically written about since the French in 1620. If smelting were to have occurred, then one would assume some forms of smelting kilns and crucibles would also have been found. As research continues into the future, more information will undoubtedly change our present knowledge; however, the mysteries of ancient copper production are subject to much curiosity, marvel and academic debate. Amateur and professional experimental metallurgists and archaeologists have attempted the rediscovery of ancient copper tool manufacture. The awe and curiosity elicited by carbonated (found in situ with soil or charcoal from ancient fire pits) and oxidized (found in situ in water) artifacts have been the stimulus to reproduce ancient copper tool forms. 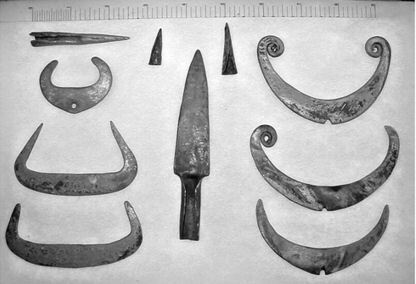 The ancient tools were often associated with copper mining pits hammered from amygdaloidal copper deposits or excavated from glacial till in the form of float or simply as nuggets found in eroded stream beds of the Lake Superior Basin. Michigan's Upper Peninsula has abundant native copper deposits of amygdaloidal crystal and floats and has the highest frequency (with the exception of northeastern Wisconsin) of ancient tool discoveries by today's rock collectors and amateur and professional archaeologists. Joseph Neubauer Sr., of Pine City, Minnesota, who had been affected by the Miskwabic spirit, studied for over six decades to understand the mysteries of copper tool manufacturing. He passed away in 2012 at age 93. Joe discovered the Northwest Company's 1804-5 wintering post on the Snake River near Pine City, Minnesota, in 1932 and reported this discovery to the Minnesota Historical Society shortly after returning from WW II. This historic site (21PN11) was excavated and reconstructed by Dr. Leland R. Cooper, archaeologist, Hamline University, in the 1960s. Prior to the site's excavation, Joe had also found evidence on this site of copper usage including socketed and conical points, one bead, awls, debitage and worked pieces, plus lithic evidence dating back possibly 10,000 years. Joe also discovered an ancient copper worksite near Beroun, Minnesota, the Robert-Debra Neubauer Site (21PN86). From these culled native copper specimens, Joe has reproduced over three hundred finished ancient tool and ornament duplicates, including twisted-stem-handled ulus, deep-socketed and shouldered spuds, knives, and spear points of over twenty authentic shapes and forms. Joe has three white-oak-ember fire beds for annealing when seriously experimenting in order to provide more time on task. The entire process that is described and applied by Joe is termed the "Neubauer Process." Joe has studied academic literature, museum collections, and private collections of copper artifacts, including the comprehensive Wisconsin collections of Dr. Earl Johnson and Gordon Morris. A colleague and amateur archaeologist, Dr. Tony Romano, Pine City, Minnesota, has been a frequent companion haring ideas on possible metallurgical processes. Dan Koss of Michigan and Gordon Morris and George Weimer from Wisconsin have provided valuable geographical information that has led to Joe's studying float locations in Upper Michigan and Wisconsin. Tom Amble, Minnesota Historical Society, and David H. Peterson have been mentors encouraging documentation of the "Neubauer Process." Joe is often heard to say, "To those who care, share, and compare without academic nonsense, I give my sincere admiration, appreciation and a hearty thank you." Since Joe began experimenting with copper, these and many other friends say to Joe, "Thank you for attempting a manufacturing process we know not of nor have the time to attempt ourselves." Since 1999, when Joe began seriously experimenting with native copper, some of his original theories about copper tool construction have changed following more than four thousand anneal-pound cycles. The ancients and Joe learned that the final product resulted from the manner in which native copper must be worked. The copper nugget's original characteristics prior to manufacturing lead to the end result, and its physical properties must be followed. The average finished reproduction requires fifteen anneal-pound cycles with complex styles such as twisted-stem-handled ulus requiring up to thirty cycles. Several major discoveries, such as creating copper surface bubbles with white oak ember annealing, have been documented and duplicated several times. Dozens of artifact reproductions have been displayed for public and professional analysis, including ingots and final reproductions exhibiting the bubble trait with silver inclusions. 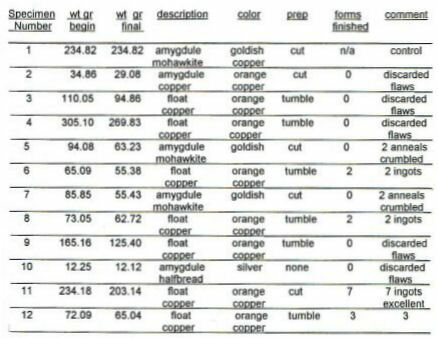 A four-year experiment in Michigan crystal float copper, Mohawkite and silver half-breed float annealing and pounding into all categories of the Warren Wittry Classified artifacts has been accomplished. Joe, a professional metal smith with sixty-five years of experience and WW II Navy Metalsmith First Class, with science studies at Marquette University, Milwaukee, and University of Wisconsin, Madison, whose grandfather and father were blacksmiths, has devoted the last four years to rediscovery of metallurgical techniques possibly used by the ancients in their magnificent and unique tool and ornament processes. This presentation is for the purpose of encouraging further study in the annealing by white-oak embers and shaping by pounding of native copper specimens and to stimulate youth to further scientific research to pursue the mystery of the ancient's copper manufacturing process. Major conclusions can be summarized as follows:Ancient copper artifact forms can be annealed and pounded. Smelting or melting is not required. Arsenic copper specimens cannot be pounded into a new shape due to brittleness and cracking. A difference in copper specimen malleability exists between hot and cold pounding. Hot ingots continue to realign their molecular structure even while being pounded and can therefore absorb a significant increase in the number of impacts made prior to returning to existing environmental temperature. However, hot ingots are very difficult to physically handle. Physical and mechanical application of force vectors and techniques utilized in the "Neubauer Process" include grinding, chiseling, pounding, bending, drilling, swedging, application of mandrels, reaming and controlling the ember bed temperature (wind, draft or air flow caused by the fire itself). The diamond-shaped cross section found on rare ancient knife blades and spear points provides tool blade strength but is a very difficult manufacturing process to complete. This blade cross section was manufactured with much patience and very careful hammering; and due to the characteristics of copper, the same was probably true in prehistoric times. Copper can be shaped by swedging against rock surfaces, ungulate foreleg bone, mammoth tusk, hardened copper mandrels, hard wood and specially formed, hardened copper forms. Additional Experiments Underway Twelve nuggets have been selected and some have been manufactured into reproductions. Each nugget and its characteristics during the anneal-pound cycles, including the resultant debitage and final tool forms, have been journaled. Selected ingot stages leading to the final tool reproductions have been photographed. White-oak embers produce heat high enough to extrude fluid copper bubbles on the ingot's surface from the foreign mineral or elemental gas released from within the ingot. The bubble trait is rare because most gas is released through the cracks and crevices normally found in native copper mass. Artifacts that appear layered may not have been folded from a single flat-pounded native copper sheet (ingot). The common theory of a flat sheet of native copper being folded upon itself to make a thicker artifact may not be correct, as apparently solid nuggets when annealed and pounded often resemble a folded cross-section. Joe has demonstrated that apparently folded reproductions are not and, in fact, are produced from visually solid nuggets, which have sedimentary deposits of a mineral element (calcite, epidote and arsenic are suspected) that produce flaws. Some flaws are microscopic and are not observable until the late stages of the anneal-pound cycles. Specimens with visible flaws which are used from the first anneal-pound cycle to the final form will exhibit, under cross section examination, a folded appearance. This is due to the compression of the various original imperfections and layers of mass found within the specimen and not by folding of a single thin sheet ingot. Copper-bearing rock occurs along the Snake River, Pine City, Minnesota, from the outlet of Cross Lake and extends for several miles downstream. Native copper weighing from ounces to one hundred forty pounds has been found, and Joe has personally found an ancient copper knife and a 2 1/4 pound specimen. This experiment, through application of the Neubauer Process, reports on the selection of twelve native copper specimens from the Lake Superior basin and follows each specimen's manufacture into ancient tool and ornament forms by annealing and pounding. Copper tools whose wood hafting remains have been preserved due to anti-bacterial protection by copper oxides have been radiocarbon dated to 6800 BP at South Fowl Lake, Minnesota, site 21CK1. This date for a completed copper tool and inferred technology indicates that the people who inhabited the Lake Superior basin from 7000 to perhaps as early as 8000 years BP were utilizing amygdaloidal native copper or native copper float deposited by the glacial retreat 10000-12000 BP. They mined the amygdaloidal native copper, as evidenced by thousands of man made pits found in Minnesota, Wisconsin, Ontario, Isle Royale and the Upper Peninsula of Michigan. A skillful, energetic and prolific experimental archaeologist, Joseph Neubauer Sr., has been an active professional metal and coppersmith for over sixty-five years and has manufactured hundreds of native copper specimens into hundreds of tool and ornamental forms identical to the artifacts left behind by ancient copper workers. The manufacturing steps termed the Neubauer Process, published in Central States Archaeological Journal, Vol. 50, No. 2 Spring , 2003, documents the fundamentals that Joe has learned and applied to native copper. These manufacturing fundamentals definitely mirror the debitage and final forms created by the ancients. Native copper can be transformed by hand from its natural condition into shapes by a patient, meticulous and precise application of heat (to soften) and pounding to shape and harden. Repeating the anneal-pound cycle for up to thirty cycles will manufacture tool forms such as shouldered obverse and reverse ridged spear points and long arm-twisted ulu crescent knives. Smelting or melting has not been required. The experiment being reported was to follow the characteristics found in twelve native copper specimens from Upper Michigan's Keweenaw Peninsula. The specimens were selected for the purpose to anneal and pound them into a completed tool form identical to at least one known ancient artifact. Hidden or minute mineralization of elements or molecules differ from pure copper and develop into flaws and appear at any cycle and often rendered pounded ingots useless for the intended form. In the first year of this four-year study, Joe learned that the nugget determines the cubic ingot size and the pureness of copper mineralization determines a potential final tool form. A standard or repeatable form is possible, but standardization of actual size, mass, length and width could never be accomplished or predetermined. The nugget determines the ingot sequence, which determines the final tool form and size. The coppersmith must follow the characteristics provided by the copper and other mineralization found within that specific ingot and cannot with certainty carry a nugget from a preconceived tool form to completion. Surface bubbles appear on dozens of copper ingots and final tool forms, which may be mineralization such as feldspars or calcite being vaporized and expanding within the native copper mass. These bubbles form anytime from the first to the last anneal and appear without any predictability. The bubbles do not interfere with ingot malleability or the tool's final function, e.g., strength. In 2001, twelve nuggets were culled from hundreds of native copper specimens at Houghton, Michigan's Keweenaw Gem and Gift. This mineral supply company, owned and operated by Cindy and Ken Flood, provided native copper specimens and expert geological consultation. All nuggets had been cut or tumbled clean. 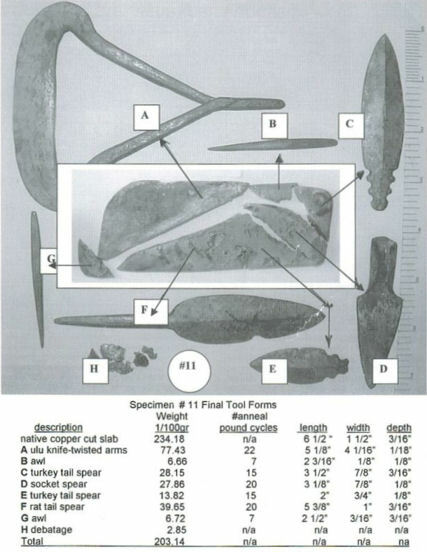 This allowed Joe, Ken and the author to analyze, in detail, every surface feature and apparent mass solidness of hundreds of specimens prior to selection of the final twelve study specimens. The final twelve nuggets were selected to demonstrate a range of natural conditions such as graininess, density, mineralization of compounds different than copper, amygdule-fissure, float, color and size. Size is very important because copper is a very tough, hard to chisel-cut substance even when annealed into a softened state. Much time and energy is applied to large nuggets in order to reduce the mass to smaller ingots. A large specimen becomes far too difficult for the efficiency of time and task vs. creating a functional tool. This may explain the lack of large-sized artifacts and the lack of standardization from the tens of thousands of copper artifacts found throughout North America. Even in America's fertile eastern Wisconsin "fields" of copper artifacts, there does not appear to be a standard size found with any particular artifact tool or ornament form. The twelve raw native copper nuggets were weighed, visually studied and photographed. All nuggets were analyzed and photographed immediately after the first anneal (heated to red hot in a white oak ember bed) prior to the first pounding, which initiates the beginning of cubic ingot formation. Additional documentation with photography of all specimens occurred when the ingots began their conversion to smaller masses due to flaws which demanded chiseling (cutting) or pounding off flawed flakes, wings, scales or small masses. Chiseling was impacted upon the natural lines of flaws found through the anneal-pound cycles in order to cut the original mass into usable smaller ingots that could go forward in the manufacturing process to create some type of a smaller tool or ornament form. As the chart and photographs demonstrate, one Mohawkite specimen was saved without any application as a control sample, two Mohawkite specimens were useless because they crumbled into unusable small pieces early in the anneal-pound cycling, four of the solid float specimens produced at least one final tool form, three apparently solid float nuggets were so filled with mineralization that they were discarded early in the anneal-pound cycles and one half-breed amydaloidal specimen was a high percent native silver and resisted malleability and was discarded due to crumbling after the third anneal. Many of the discarded specimens did not exhibit serious mineralization and the resultant flaws until numerous anneal-pound cycles had impacted the specimen. The cracks, gaps and holes that develop, as minerals other than copper are annealed and pounded out of the original mass, are defined as flaws. The mineralization of elements and compounds other than copper was often deep within the mass and were not released until the cubic rectangular ingot was being formed. Nugget eleven was an excellent example of the variety and quality of tools that can be pounded from a relatively small specimen. The processing of the specimen from a raw slab of float into seven final tool forms provides an excellent example of the Neubauer Process. Native float nugget number eleven produced seven excellent, strong, unflawed final tool forms, from the difficult twisted stem ulus (requiring 22 anneal-pound cycles) to simple awls (requiring 7 anneal-pound cycles). 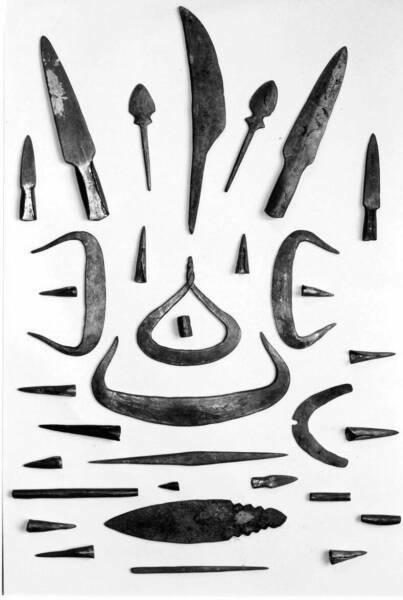 This demonstrates the wide range of tools that can be chiseled off smaller ingots along natural flaws, pockets and lines that occur in the original mass. The flaws, pockets and cracks reveal themselves in the anneal-pound process. Sorting dozens of slabbed specimens with obvious mineralizations helped avoid poor quality specimens in the process. The nugget selected indeed yielded a very low percentage of debitage, discarded chips, red dust and grainy marl waste by-products. Comparing the original nugget weight to the weight of all completed tools and scraps proved the solid mass. A Jolly balance test for density was not used; hence, it demonstrates that ancient copper workers could have selected native masses that would have been cost-effective to manufacture tools from. It also demonstrates that some raw nuggets are totally hopeless and crumble with the anneal-pounding after the first cycle. This might indicate that trading cubic rectangular ingots or finished tool forms would have been the most cost-effective commodities from the copper ranges of upper Michigan thousands of years ago. Joe pounds and throws approximately four times as much mass unto his junk debitage pile as the total mass found in his completed tools. The nugget yielded seven final tools by only applying heat from oak embers, pounding, chiseling to cut, bending and limited abrasion by sandstone. Modern steel hammers and anvils were used throughout the experiment to increase the speed of production. Rock hammers and anvils of hardened copper, rock or wood produce the same results as modern tools but require more time on task. In all instances swedging was required as the applied physical force vectors applied to the obverse surface of a cubic rectangular ingot transfers through the ingot's mass unto the reverse side (180 degrees opposite), which is contiguous to the anvil's surface. This is the inevitable and only application of force to the molecular structure of native copper mass, and it is why the cubic rectangular form is a critical step in the Neubauer Process. The cubic rectangular form is very common debitage found at ancient worksites and campsites. Native copper, naturally occurring 99.75-99.98% pure copper, is a unique metal found throughout the Lake Superior basin, inclding Ontario, Michigan, Minnesota and Wisconsin. Native copper does occur in the Appalachian Piedmont area of Georgia, Tennessee, Virginia and North and South Carolina and at several other locations around the world; however, the Lake Superior basin native copper is unique because of the random trace elements such as silver, arsenic, nickel and iron. These trace elements provide unique mineral combinations to the lake basin copper deposits such as half-breed (silver and copper) and Mohawkite (Cu3A5 or Cu6A5) nuggets and float. These combinations exhibit vastly different malleability characteristics when annealed and pounded as compared to relatively pure native copper. Native copper nugget number eleven was a "mother lode" for production. Ken Flood has cut specimens, such as number eleven, into thin slices from native copper float or amygdules with diamond saws for display and mineral sale. These slabs are manufactured with modern technology but provide an unusual ability for an experimental archaeologist to apply keen visual inspection for mineralization and flaws. A density test with a Jolly balance can also be used to define specific gravity and hence the probable purity of a copper mass. This experiment did not use the Jolly balance test for density. Slab specimens are excellent samples for the anneal-pound cycle, Neubauer Process, as they are genuine float or amygdaloidal copper but expose a greater surface area, which provides a quick comprehensive visual analysis. The experimenter is less likely to waste time and energy creating an ingot that cannot physically endure the numerous anneal-pound cycles required for a final tool form production. The ability to cut and create slab forms of native copper with diamond saws was not an option the ancient copper masters could use. However, the ancients could and clearly did obtain near perfect masses of copper by annealing and pounding off flakes or smaller masses of pure copper from the many large copper float erratic boulders found throughout the copper ranges. The famous Ontonagon boulder from the Ontonagon River demonstrates around its entire surface the worrying off of smaller copper masses by the ancients. The smaller pieces of copper mass obtained in this manner would have provided the ancients with a flawless mass from which they could pound flawless ingots. This is because the mass, without internal flaws, could clearly be moved back into itself to form the required cubic rectangular ingot that is a critical step in the Neubauer Process. 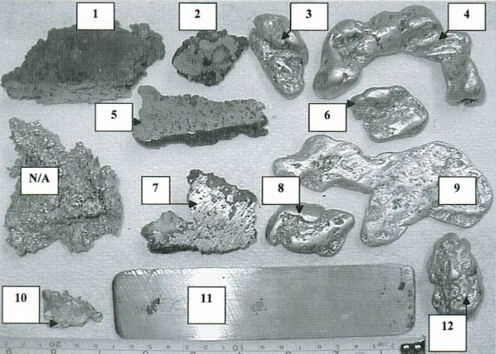 No bubbles were realized on any of specimen number eleven's final tool forms and none were observed on the ingot's surfaces during the manufacturing cycles of this nugget. It is speculated that the 3/16-inch even thickness of this slab may have allowed for any mineralization to vaporize during annealing. The twisted arm ulu exhibits flow lines or pressure ridges where the copper mass bunches up into ridges as the long form of an arm is drawn out and bent from the cubic rectangular ingot. This pressure ridge or flow line characteristic is observed on many anneal-pounded tools, especially those exhibiting length and bending. Several tools show a layered characteristic, which appears to indicate a folding of a thinner sheet into the final tool's form. In all instances, this folded appearance is derived from pounding the ingot flawed internal mass and not from folding a thin sheet into a thicker mass. The final seven tool forms were determined after the third and through the seventh anneal-pound cycle and only after a solid cubic rectangular shape could be produced. The shape and size of the completed cubic ingot then, and only then, was the critical factor which led into final tool production. No melting or smelting was required or necessary for any of these tool forms or several hundreds of other Neubauer Process completed tool and ornament forms. The debitage, dust, cracked and flawed ingots, photographs and finished tool forms for the entire set of twelve original copper specimens have been saved and are available for further study. 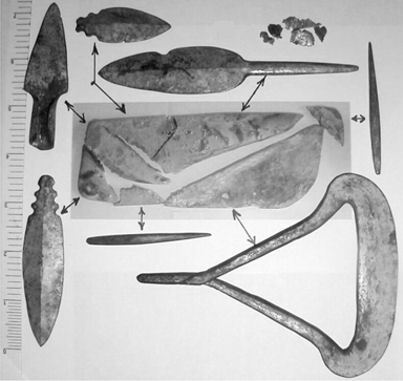 Included with this saved set of data are examples of ingots and tools with surface bubbles, ingots and finished tools with silver inclusions and bubbles on the same tool, anneal-pounded tools with a folded appearance, tools with pressure ridges and/or flow lines and deep-shouldered socketed spear points. All experimentation has been accomplished through the unique approach provided by the Neubauer Process.